While many people with oily skin get blackheads and other blemishes, not everyone who has oily skin does. In some cases, people can suffer from oily skin that leaves their face feeling less than fresh while still having clear skin. Finding the best face mask for oily skin whether you suffer from acne breakouts or not can help you have the complexion you long for without spending tons of money or going to a lot of hassle. So, here we are reviewing some effective, good quality and well reviewed face masks you will find helpful if you have oily skin with or without acne breakouts. 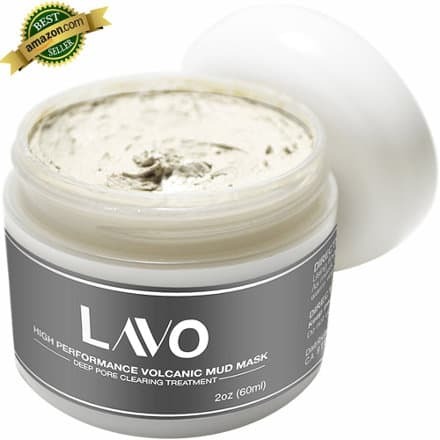 Lavo Face and Body Mud Mask is a great volcanic mud mask that helps to balance oily skin and treat both acne and many dry skin problems. Comes in a 2 ounce jar. 3 clays in one kaolin, Diatomaceous earth, and fuller earth. Treats Keratosis Pilaris (chicken bumps), Psoriasis, and Eczema, as well as acne and oily skin. 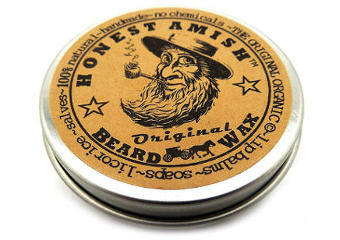 Applies anywhere on body, 10/15 minutes drying time. Diatomaceous earth, Fullers earth, Kaolin, Glycerin, Aloe Vera gel, Zinc Oxide, Sodium Alginate, Allatonin, Guar gum, Sage Oil, Eucalyptus oil, Vitamin E, Phenoxhyethanol, Potassium sorbate. Use 2 or 3 times a week on face or problem areas of face or body. Spread a thin layer over desired area and wait 5 to 15 minutes or until the clay dries and you will feel the skin tightening slightly. 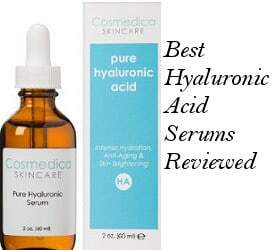 (For sensitive skin dilute with purified water 50/50). Once try to remove with warm water rubbing gently in a circular motion. Rinse face well and follow with toner and moisturizer. What do Lavo Mud Mask Reviews Say? Draws out blackheads and brings white heads to the surface. Leaves you with smoother, softer skin. Lasts quite a while even though the container is only 2 ounces. If you have never used a mud mask before, start out by diluting it with purified water to help ensure that it won’t irritate sensitive skin. 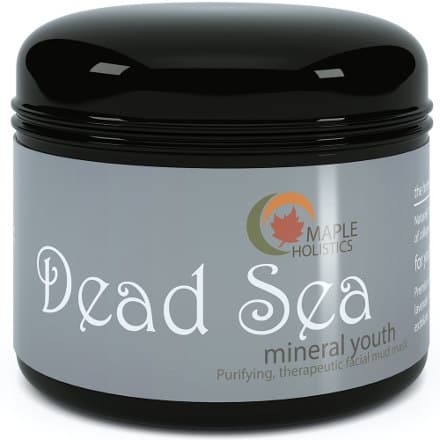 Maple Holistics Dead Sea Mud Mask for women, men and teenagers helps to balance oily skin by combining mud from the Dead Sea with other skin nourishing ingredients to give your skin an overall healthier look and feel. Comes in a 9 ounce container. Dead Sea mud from Israel. Helps to maintain skin natural elasticity. Enriched with an organic formula. Dead Sea Mud, Almond Essential oil, Organic Clary Sage, Organic Lavender, Organic German Chamomile, Biodynes EMPP and Pseudocollagen. Apply a thin layer of mud to clean damp face and massage gently with a circular motion. Leave on between 5-20 minutes until mud dries, rinse well and pat dry. What Do Maple Holistics Mud Mask Reviews Say? Balances oily skin perfectly well. The VoilaVe Dead Sea Mud Facial Mask comes with a 365 day money back guarantee which makes this facial mask well worth trying. Imported Dead Sea Mud from Israel. 100% Natural, no chemicals or artificial additives. The ingredients in this facial mask are all organic and natural and they are: Pure Dead Sea Mud, Shea butter, Sunflower oil, Aloe Vera Juice, Vegetable Glycerin, Jojoba oil, Hickory extract bark, Calendula oil, Filtered water and Xanthan gum. Apply a thin layer to clean moistened face or body avoiding the eye area. Leave on for 10 or 15 minutes. Rinse off with warm water and pat dry. 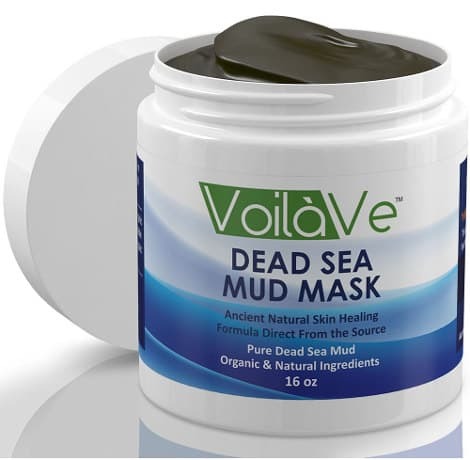 What Do VoilaVe Dead Sea Mud Mask Reviews Say? Creamy textured mask that is easy to apply. Skin feels clean and refreshed. 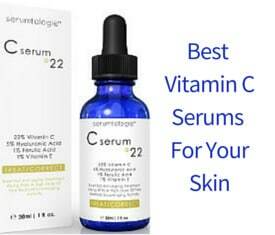 Brightens your skin while reducing acne, oil, and blackheads. In conclusion, finding the best face mask for oily skin can not only leave your skin feeling less oily but overall healthier, softer and brighter looking.